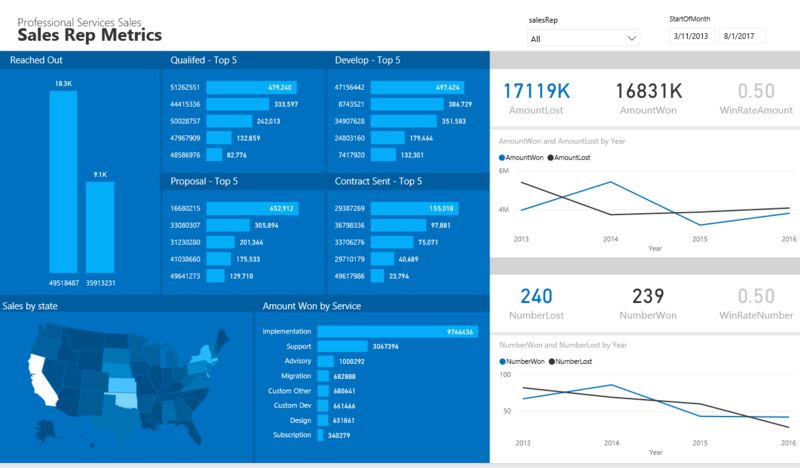 Real-time, dynamic reporting and analytics for B2B inside sales accelerated with Power BI; created for a professional services company in the technology sector. The client is a small professional services company providing advisory, development, support, and implementation services to companies and organizations across the US. Their inside sales team uses a popular Software-as-a-Service (SaaS) platform for managing sales activities and tracking leads. The platform has some analytics functionality, but does not meet the client's needs. 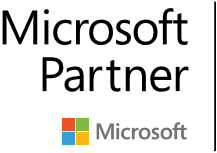 The client relied on manual data exports, 3rd party data connectors, and Excel to produce KPI's and reports. The client required a more effective solution to track and analyze their sales activities and performance. 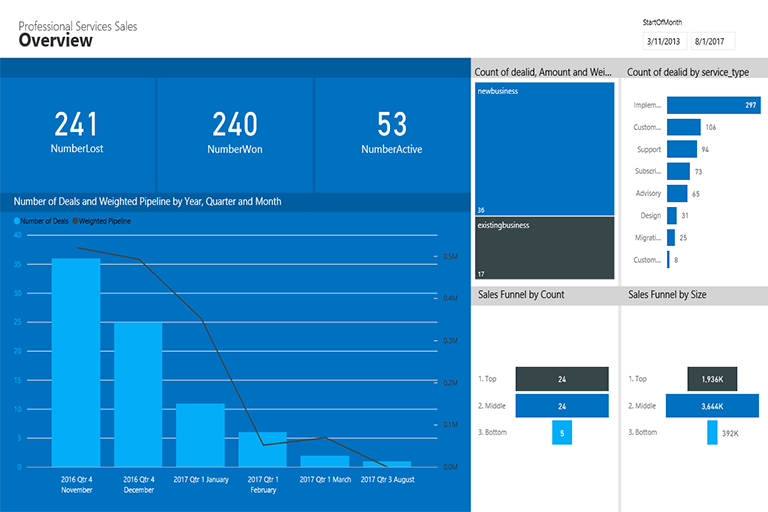 Portal Solutions designed a Power BI report using direct connections to the client's SaaS sales platform to meet the client's reporting needs. The solution provides a real-time overview of their sales pipeline, from tracking deals as they move through the sales funnel to giving insight into the progress and performance of individual sales representatives. The Overview Report provides real-time insight into the overall sales performance and status of the client's sales funnel and sales pipeline. Data can be sliced and filtered by the type of business (new customers or existing customers), the type of service being provided, and by the expected close date of the deal. Drill-down functionality on sales funnel visualizations allows the client to drill from a high-level view of their pipeline down to individual stages. The Sales Manager Metrics Report gives sales leadership quick access and insight into the performance of individual sales managers. Managers now have access to an overview of each manager's past performance and active deals, sliced and filtered by date and service type.